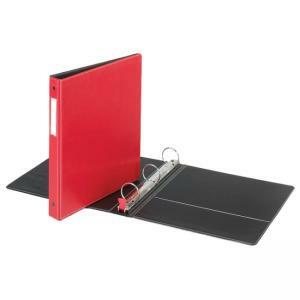 Locking D-Ring Binder opens and closes with the touch of one finger. Lock instantly engages when closed, eliminating two-handed, two-step operation. Received "Ease-of-Use" Commendation from Arthritis Foundation. Embossed cover material has black lining, inside pockets and a label holder on spine. Binder contains 44 percent post-consumer material.